Most rubber grades are as thin as 0.016" to 0.250" thickness. It is also measured in terms of hardness (durometer) as soft as 30 and as hard as 90 duro. Materials are also available as continuous rolls or cut-to-size. 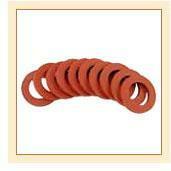 Rubber washers are widely used for sealing of flanges. It is estimated that around 50 to 80% of all leaks in flanges are caused by insufficient bolt pre load. The bolts are usually all tightened to a given aim pre load. At this original pre load the bolt has a certain amount of stretch and the process fluid heats up the flange and gasket after some time causing them to expand more than the bolts. This leads to loosening of the grip. Flange Washers are effective because they add deflection to the fastening system. The use of flange washers has a positive impact overall on the performance of a live loaded flange joint. Flanges where failure could cause a safety problem. Joints that see wide fluctuations in temperature. One or more of the flange components are subject to yielding like vibration, gasket creep, bolt creep, or elastic interaction. The flange has a long history of maintenance problems. Flange joints which develop leaks on account of various reasons like differential thermal expansion, bolt creep and vibration. To maintain sufficient bolt tension. To maintain gasket pressure by compensating for gasket relaxation, bolt creep, and differential expansion during temperature/pressure changes. Flange washers maintain the high loads necessary to keep flange joints tight and leak free. Flange Washers prevent damage to bolts and gaskets.